Company Helps Save Large Trees From Certain Fate At Site Scheduled For Demolition And A New Tunnel. SEATTLE, WA: Big Trees, Inc. (http://www.bigtreesupply.com/) has assisted in the relocation and saving of several large maple trees from the Seattle Viaduct project site, which site was slated for destruction, making way for a new tunnel. 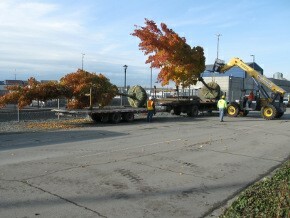 The large trees were relocated to a nearby construction site built by The Port of Seattle. Big Trees, Inc. was requested to help with the replacement project in an attempt to save the trees, a group of large, columnar, fall colored maples measuring at 30-35’ tall. The trees were carefully dug, prepped with burlap and drum-laced with rope. Then the trees were rigged, lifted and loaded on a flatbed truck and trailer to be transported and off-loaded in the various planting areas staked out at their new home. The project went so well with the first twelve trees, the Port requested additional trees be moved. 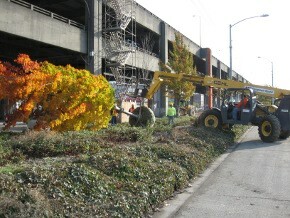 Once all trees were out of harms way near the Viaduct demolition, they were replanted in 3-4 large planting areas at a new road construction project the Port of Seattle had just completed off East Marginal Way South, near the West Seattle Bridge.